Is your fondest dream to sail the seven seas in a life of adventure and exploration? To demolish the competition on the race course, freeing the fierce warrior within? To leisurely sail with your friends or a sweetheart to the perfect picnic spot on a gently wafting breeze? If you answered “Yes!” to any of these, or if your sailing dreams take on a completely different configuration, a good place to start is Latitude 38’s Spring Crew List Party. Crew Party sailors mingle at GGYC’s bar last March. 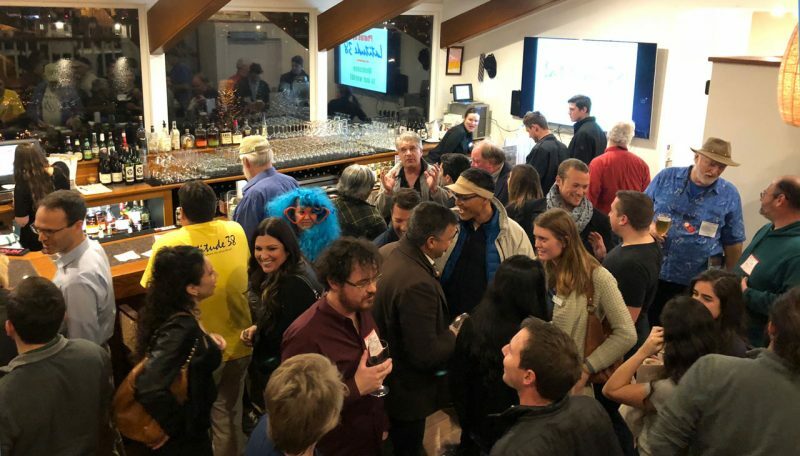 Golden Gate Yacht Club on the San Francisco Marina will again host the shindig. Mark Thursday, March 7, in your calendar, and show up at 6 p.m. (but not earlier — we won’t be ready to greet you). Have a 10-spot ready to hand over to the nice people at the entrance (or just a fiver and an ID if you’re 25 or under). As usual, along with the opportunity to meet and match up with fellow sailors and hobnob with the Latitude crew, the price of admission will get you a hearty munchies buffet, color-coded name tags to aid in mingling, a door-prize drawing, and an inspirational sailing slide show. GGYC’s bar will be open and selling drinks, and we’ll have Latitude logowear available to purchase. 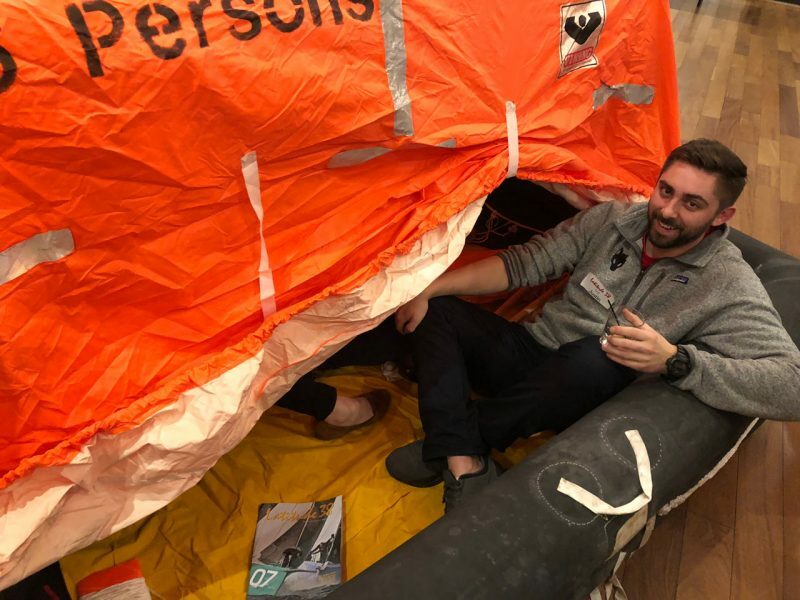 Sal’s Inflatable Service will bring a liferaft to ‘blow up’ and party-goers can crawl inside to see what it might be like when the call is made to abandon ship. How many of you can fit in there? 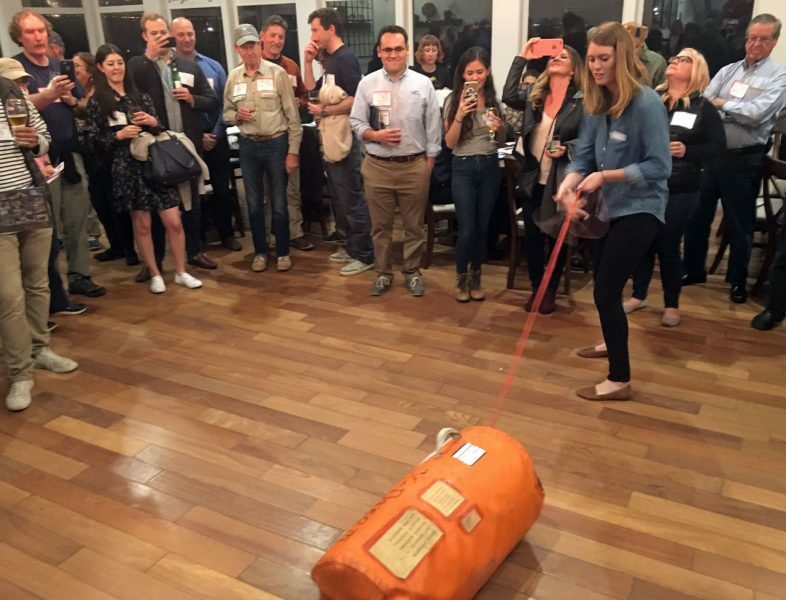 A party guest pulls the cord to inflate the liferaft. Chances are, if you ever have to crawl into a liferaft on the open ocean, you won’t have a cocktail in your hand. Check for updates at www.latitude38.com/crew-party. You don’t have to be on one of our free crew lists to come to the party. But, if you’re serious about finding a ride or finding crew for your own boat, we recommend signing up online in advance of the party. You can also ‘shop’ for an appropriate sailing cohort by reading the listings and contacting likely prospects. Then, arrange for a first meeting in the neutral territory of the Crew List Party. We offer lists specializing in Cruising, Racing, Daysailing and Mexico-Only. I assume the goal for only charging a $5 entry fee rather than the “normal” $10 entrance fee is to those 25 years of age and younger is to inject “new” blood into sailing as a way to improve the survivability of the sport. However, as a 75-yr old who has been sailing for decades, the practice smacks of ageism and I find it insulting personally as well as an impediment to bringing older neophytes into the sailing community. I think too much of today’s society kowtows to the younger generation and leads to the invisibility of us older folks. Comments? Hmm. Do you complain equally about senior citizen discounts? On Monday, February 25 at 7:00 p.m., the City of Alameda will continue to discuss the Request for Qualifications (RFQ) for a boatyard operator at the new Alameda Marina. On Saturday, February 23, Richmond Yacht Club is inviting anyone interested in trying out sailing on small boats to their well-rehearsed Sail a Small Boat Day. This successful format has introduced thousands of non-sailors to sailing the Bay. We should mention — it's free.